If you’re planning a restaurant business you need to understand financial statements. 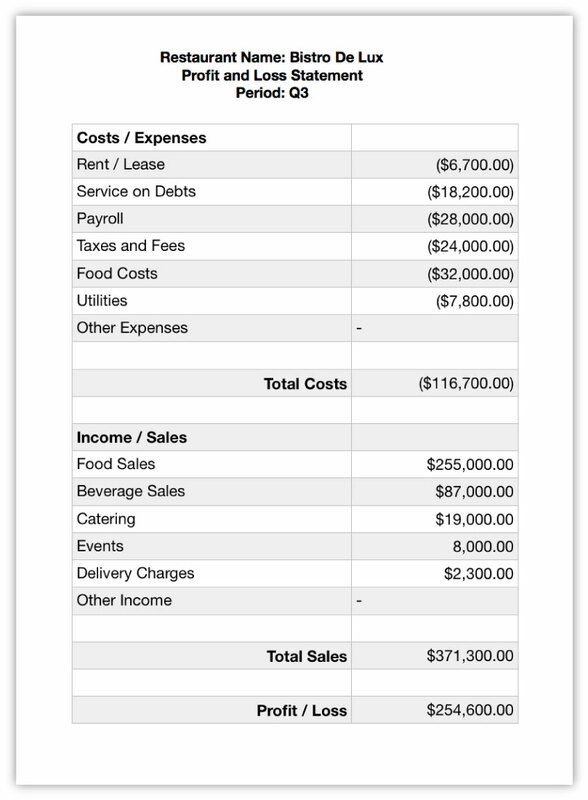 Understanding restaurant financial statements is a key step in completing your business plan. Financial statements are reports generated to show the overall financial state of the business. They are a formal record of financial activity. These records are important because they reveal the financial well-being of the business. Quarterly financial statements contain financial data for the business during each three month period. You will also prepare an annual version of the same reports after your first year. Use data for the whole year as the reporting period. Eventually you will also create financial statements comparing data from multiple years. This will show the restaurant's financial health over the years. It will show “good years”, “bad years” and the rate of growth (or loss) over the life of the business. Next we’ll look at each financial statement in detail. You’ll learn how to read a financial statement and how to complete your own. 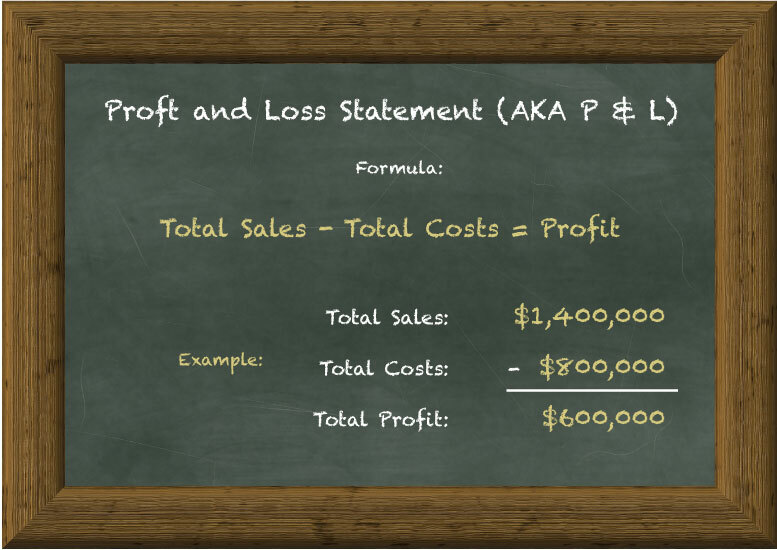 A “P and L” is a profit and loss statement for the restaurant. It uses a very simple formula that tells you how much money you've got left after taking into account all the costs associated with the business. Though it’s a simple concept, this may be the most important number in your business. The terms used on a P&L are sometimes interchanged so it can be a bit confusing when you first learn. It is important to know what people are talking about. A P&L can also be referred to as an Income Statement. Sales can also be referred to as Income or Revenue. Costs can also be listed on a P&L as Expenses. And Profits can also be called Net Income. Keep this in mind and it will all be much simpler. When discussing profit and loss these terms are thrown around interchangeably, although they mean the same thing. When doing your own P&L it's a good idea to break Sales and Costs into sub-categories that are meaningful to you. For example, Sales grouped by service-type (Dine in, Takeout, Delivery) and Costs divided into food cost, utilities, rent, etc. 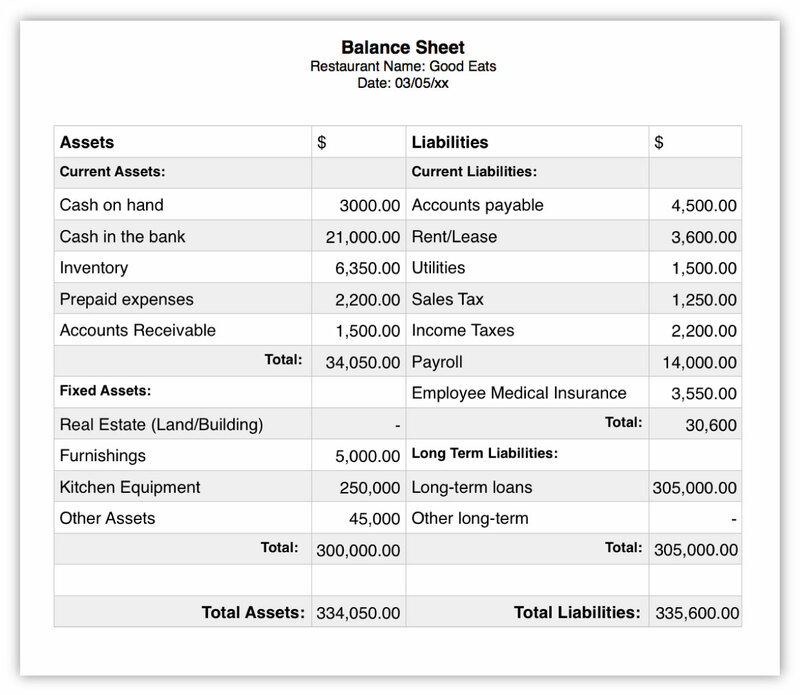 A balance sheet shows net worth of the restaurant. You can think of a balance sheet as a set of scales showing Liabilities on one side and Assets on the other. They show the balance, which is where we get the name. The purpose of the Balance Sheet is to see which way the “scale” is tilted. That is, if you're losing money, making money or breaking even. Some terms used on a balance sheet are used interchangeably. Keep these terms in mind when learning about balance sheets. Another name for Liabilities is Debt. An example of debt is a loan. The loan amount will be recorded in the Liabilities column of the balance sheet. But the result of the loan—a lump sum of cash given to you by the bank — is recorded as an Asset. Equipment with long term value or property purchased by the business is also recorded in the Assets column. Even if you're still paying them off, those items are your Assets. The remaining amount you owe is a Liability. In this example, Assets and Liabilities “balance”, because debt is roughly equal to your assets. If Net Worth is a negative number, that means your restaurant owes more than it’s worth. This is what they call “being in the hole”, “upside down” or “in the red”. Ideally, your assets and liabilities balance. Or even better, assets outweigh debts. However, when you are starting a new restaurant there will likely be a period where your business owes more. This is why a restaurant startup is risky. It takes a large amount of capital for the business to start generating its own income. In the startup phase, you will be spending a portion of Assets on operating costs that are Expenses. Expenses are services and disposable items that do not retain long term value. A Cash Flow Statement is used to get a handle on money going in and coming out of a business. In other words, it tracks the flow of cash during the period. The cash flow statement gives readers an impression about the health of the business. It helps you understand the difference between “making money on paper” and actually having usable dollars in your account. Cash coming into the business is called inflow and may also be referred to as cash in. Money going out of the business is outflow or may be called cash out. Because the cash flow statement is a tool for understanding how cash enters and leaves the business, accounts receivable (sales made on credit) are not counted as cash in, until they are actually paid. Debts that the restaurant has are only recorded on the cash flow statement when service on the debt is paid. The balance of the total debt is not recorded on the cash flow statement because it does not affect your available cash. What is Recorded in the Cash Flow Statement? 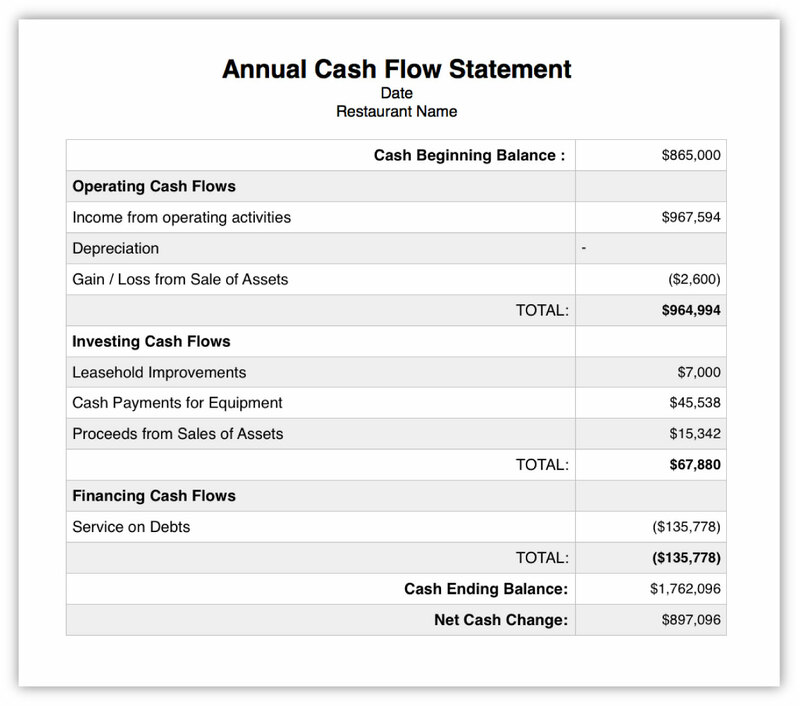 There are three components of restaurant finances that are examined in the Cash Flow Statement: operational activity, investment activity, and changes in debt/financing. Operational Activity — Most cash inflow and outflow recorded will be related to core business operations. Cash flow activity related to the core business is operational activity. Your restaurant’s sales will be the primary source of operational cash in. Investment — Cash flow changes in investment come from the buying and selling of assets. Debt / Financing — Getting a new loan is a cash flow change in Debt / Financing and will change the amount of cash out. Start with your restaurant's Net Income at the beginning of the period. From sales of food, drinks, merchandise, and other services your restaurant provides such as delivery charges and event hosting. Record investment inflows from sales of any assets. This is your total cash inflow for the period. This is your total cash outflow for the period. Total the values to see how Ending Cash compares to Beginning Cash. The difference in these two values is the Net Cash Change. This is the final number that represents the restaurant's cash flow for the period. 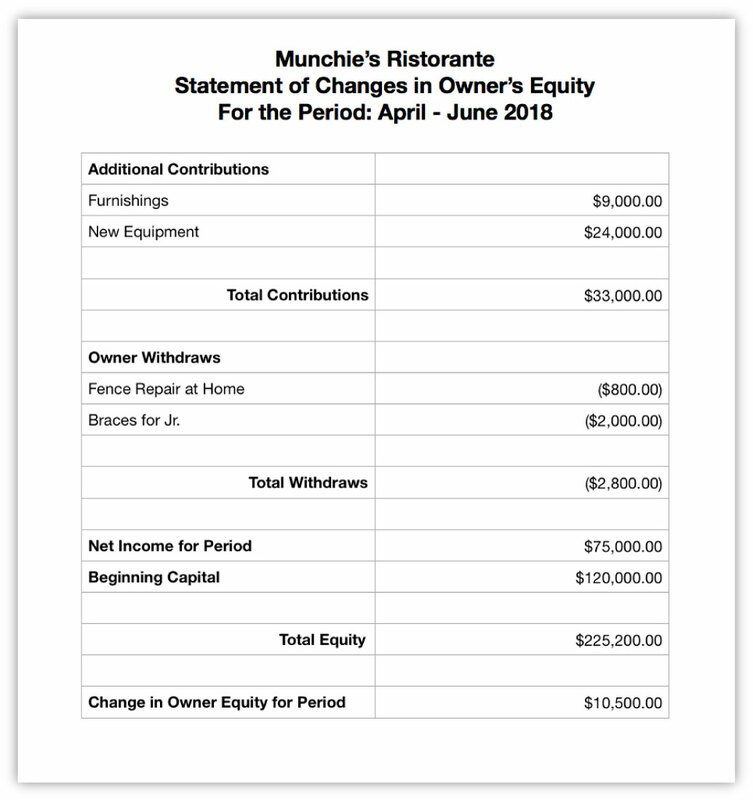 The changes in equity statement is a way of measuring the restaurant owner(s) contributions to the business. It also shows an increase or decrease in the value of the restaurant. The changes in equity statement starts with equity at the start of the period. 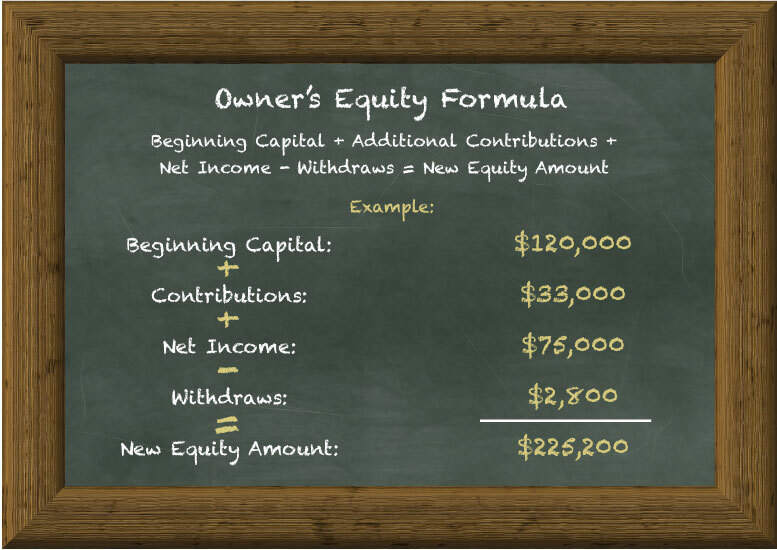 The amount of equity the owners have at the beginning of the period is the beginning equity. The capital amount that had been invested by the beginning of the period is the beginning capital. Record all additional contributions to the restaurant that the owner(s) made within the period, the dollar amount and what they were for. Add line item for Net Income also called total profit. This is how much money was made during the period. Note any Withdraws from the restaurant’s account that the owner made for personal expenses during the period. Use these values to calculate changes in equity, using the formula. The New Equity Amount is the owner’s equity at the end of the period. The difference between Beginning Capital and the New Equity Amount is the Change in Owner’s Equity. Financial statements are key documents that a business uses to keep on track and keep investors informed. Knowing the four basic financial statements is an important first step to owning a restaurant business. Financial statements will be completed for every quarter as well as annually. The four financial statements are the profit and loss statement, the balance sheet, the cash flow statement and the changes in equity statement. These reports are an important part of your restaurant business plan. After completing them you’ll have a much better understanding of your restaurant business’s financial health. This free resource is brought to you by Rezku and is part of our resource library for restaurant owners and managers. Rezku is a leading hospitality management systems developer. Our mission is to help business owners like you find greater success, through innovative and affordable technology solutions. Contact Rezku today for a free restaurant management consultation. Learn more about Rezku on our homepage.